Run the script without any parameters and it will show you a menu of options. 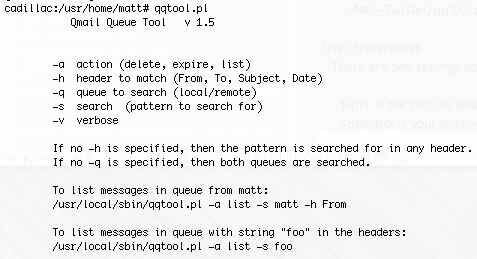 If you aren't using the defaults (/var/qmail/queue, /service/send"), edit qqtool.pl and adjust those values. Expiring messages does not remove them from the queue. It merely alters their expiration time. The messages will be removed from the queue after qmail attempts to deliver them one last time. Write the messages into a "inactive" queue before deleting them. Ability to restore messages from "inactive" to the real queue.